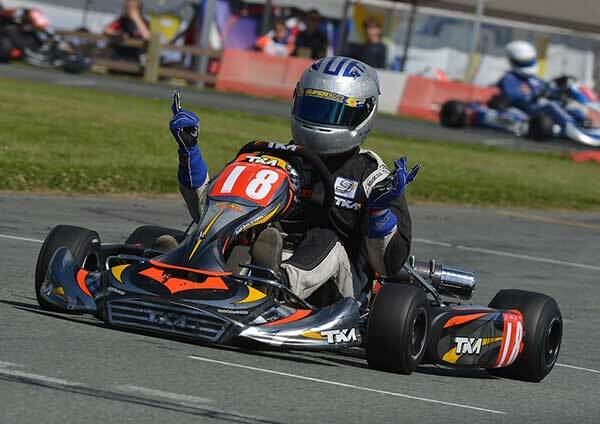 The Tuto Super One Series visited the spectacular and immaculate Glan-Y-Gors circuit in North Wales on the weekend with racing for the IAME Cadet, X30, TKM and Rotax classes. The weather was dry but cloudy throughout. Some of the Championships are very close to being settled but the regulations say that to receive a Championship position drivers must compete at all rounds unless they have special permission, so nothing is settled until PF International in September. 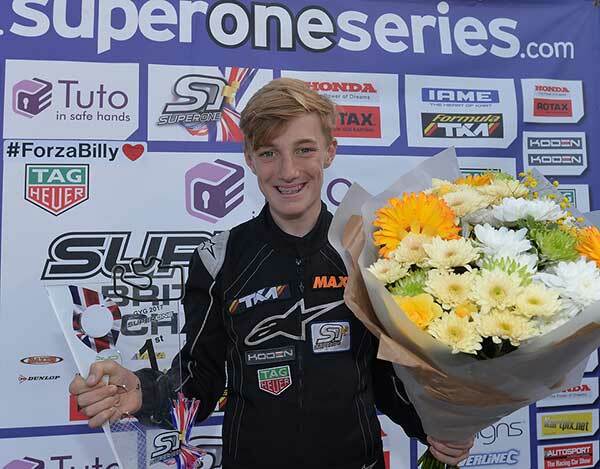 On Saturday Taylor Barnard took pole by 0.06s from Arvid Lindblad and Coskun Irfan but Irfan took pole for Final 1 with 1st and 3rd in the heats, while Barnard took 2nd and 4th. 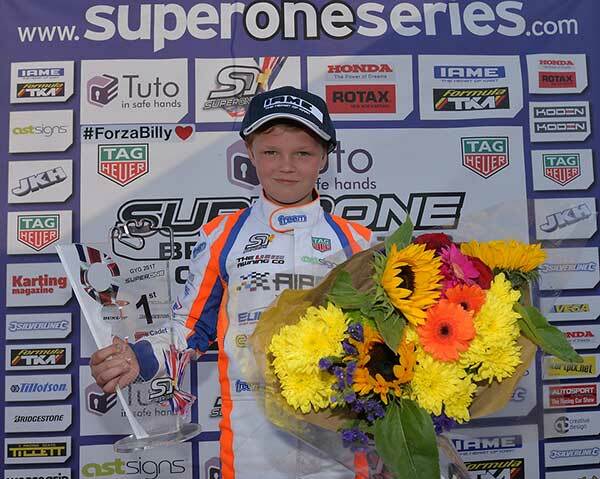 Freddie Slater was 3rd after the heats with 2nd and 4th. The unstoppable Barnard took the lead on the first lap of the first Final and stayed ahead, although he never shook off Slater. Alex Dunne passed Irfan for 3rd early on but was battling with Lindblad in the latter half so didn’t get a chance to catch Barnard and Slater. Lindblad was later penalised a lap for driving in a manner incompatible with general safety. In Final 2 Dunne and Slater both led the race in the early stages but Barnard retook control on lap 7 to win by a tenth, with the same podium positions as the race before. Dunne took 3rd after battling Irfan and Maxwell Dodds before Rashan Chigorimbo came through to 4th. 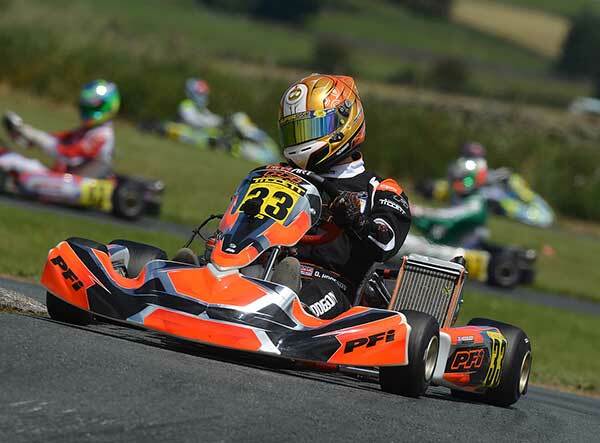 The Cadets have two rounds to go, with the next one being at Larkhall in Scotland on 13th August, and Barnard leads by 128 points from Matthew Rees with Slater a further 17 points behind in 3rd. 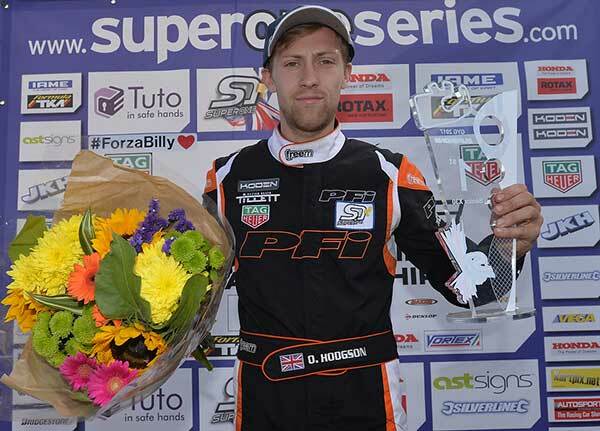 Morgan Porter narrowly took pole ahead of Samuel White and Championship leader Louie Westover, while the heat wins went to Porter, Alex Simmonds and Westover, giving Porter pole again. Westover had a DNF in his first heat so was down in 18th. Porter led Final 1 throughout apart from a lap where the closely following Simmonds nipped past, but Simmonds dropped back and Porter was penalised a lap for gaining an unfair advantage, giving Dragan Pinsent the win. Pinsent had been running just over a second behind them and crossed the line followed by Sean Butcher and Samuel White. In Final 2 Butcher led most of the race after taking the lead at the start, apart from three laps with Pinsent in control in the early stages. However, Pinsent retook the lead on the last lap to win with White 3rd behind Butcher. Louie Westover still leads the Championship, by 26 points from Butcher with Pinsent just three points behind that. The X30 Juniors have one round left, at PF International on 10th September. 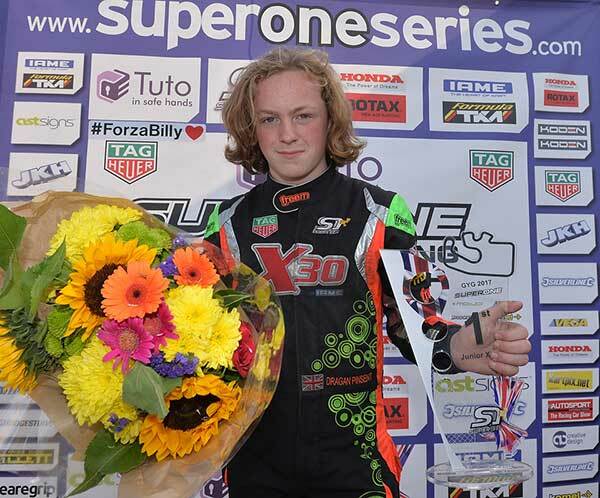 Championship leader Danny Keirle took pole almost a tenth ahead of Levi King but Oliver Hodgson, who qualified 4th, won two heats while Keirle and 3rd qualifier Mark Kimber won a heat each to take 2nd and 3rd on the Final 1 grid. 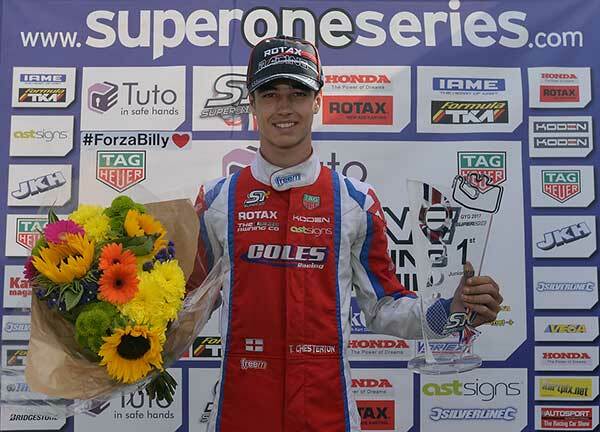 In Final 1 Hodgson started from pole and although Keirle made a better start Hodgson led every lap to win from Kimber and Brett Ward, with very few position changes at the sharp end, possibly attributable to tyre conservation. In Final 2 Luke Hughes spent a few laps in the lead following a Slow period to sort out an crash between Jenson Butterfield and Joe Turney, but Hodgson overtook and pulled away with Ward taking 2nd at half distance. Hodgson was a couple of tenths faster so Ward wasn’t able to reel him in. Keirle is now 49 points ahead of Turner and on dropped scores is very hard to catch. They now have one round left, at PF International on 10th September. Championship leader Abbi Pulling qualified on pole, 0.13s ahead of Daniel Butterworth with Robert Welham 3rd. She went on to win both heats, giving her pole for Final 1 with Alexander Page lining up next to her after two 2nd places in the heats. 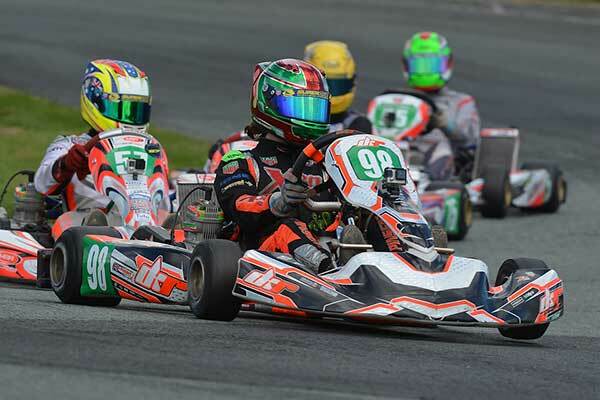 Pulling led throughout Final 1 and Page finished a few tenths behind after retaking the position from Zak Taylor early on, while Rookie Ethan Newsham foreshadowed what was to come by gaining 15 places and setting the fastest lap. Final 2 was lively with Pulling leading to start with but dropping out with a damaged fuel pipe that she had been holding on to, then Kurt Roberts and Newsham battled for the lead with Newsham securing it two laps from the end. Pulling is still the Championship leader, with a 16-point margin over Ross Deal. 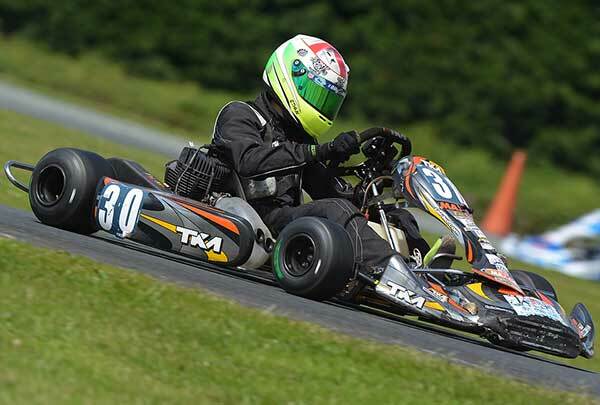 The TKM Juniors have two rounds left, the next being at Shenington on 27th August. Adam Sparrow took pole ahead of James Mills and Harry Moore, and he retained it after two heat wins while 6th qualifier Jake Campbell-Mills lined up next to him on the Final 1 grid with Mills 3rd. Sparrow led most of Final 1 apart from a challenge from Simon Vercoe who led two laps, and finished almost four tenths behind. Joe Stockford was 3rd after passing Campbell-Mills eight laps in. In Final 2 Sparrow led initially before Stockford and Vercoe joined the battle for the lead with Stockford taking the win ahead of Sparrow, after a last lap fight put the erstwhile leader Vercoe back to 3rd. 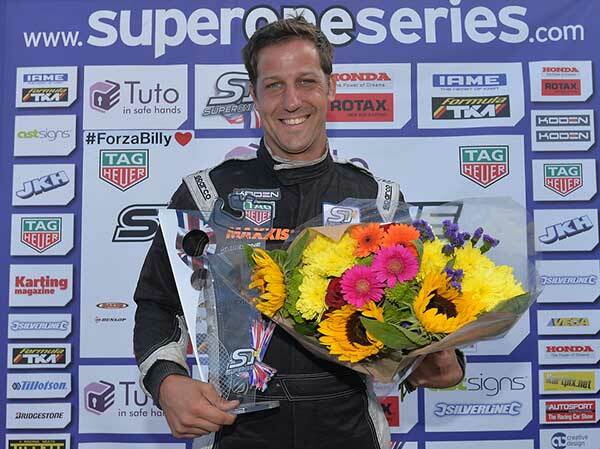 Simon Vercoe has now taken the Championship lead, 18 points ahead of Stephen Letts. 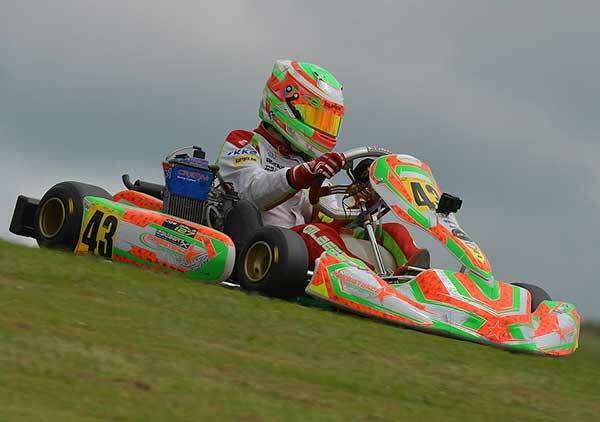 The TKM Extremes have two rounds left, the next being at Shenington on 27th August. 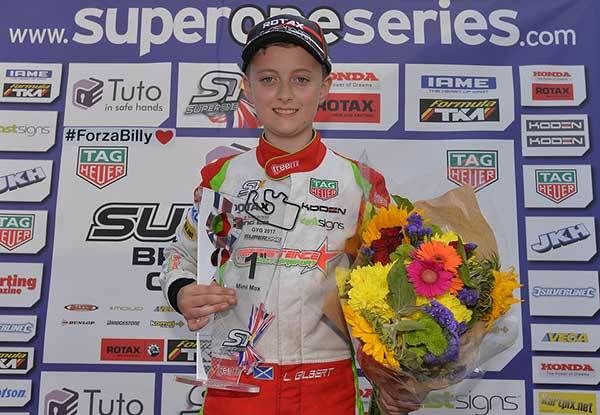 Lewis Gilbert was the poleman in Minimax, a couple of tenths faster than Jamie Day with Tom Adams 3rd. Gilbert and Day stayed at the front after the heats but Kai Hunter had moved up to 3rd after two unsuccessful heats for Adams. In Final 2 Gilbert led until halfway but Day attacked and took the lead. Then as the race reached the closing stages Hunter attacked for 2nd and Gilbert dropped to 4th with Adams recovering to 3rd. Gilbert moved up into the lead of Final 2 within the first few laps while Hunter moved up to 2nd ahead of Adams and Day. Hunter was getting closer and closer to Gilbert but wasn’t able to secure the lead. 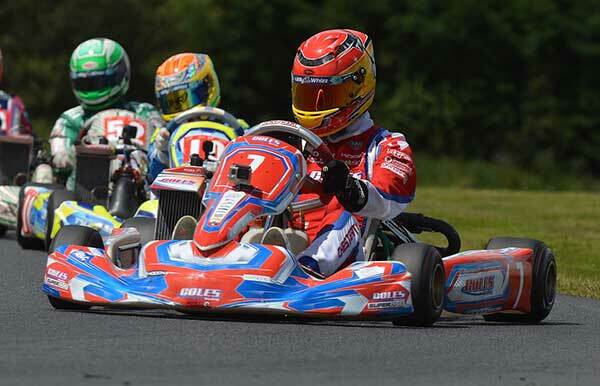 Gilbert is the Championship leader, 27 points ahead of Adams, and the Minimaxes have two rounds left, the next one scheduled for Larkhall on 13th August. Bradley Barrett took pole 0.07s ahead of Clayton Ravenscroft and Tom Edmunds who set equal times, and Tyler Chesterton another hundredth behind them. Ravenscroft and Chesterton shared the heat wins while Edmunds had a DNF in one of his putting him halfway down the Final 1 grid. The rivalry between Ravenscroft and Chesterton continued in Final 1 with Chesterton recovering from losing places at the start to close up on Ravenscroft and take the lead three laps from the end, with Ravenscroft continuing to pressure him. Barrett ran 3rd and close to the lead battle for most of the race. In Final 2 Chesterton led all the way and Barrett took 2nd at the start. Ravenscroft had dropped back at the start but worked his way back through to 2nd to finish four tenths ahead of Barrett. Chesterton is still the Championship leader, but Barrett has now moved up to 2nd ahead of Rhys Hunter. 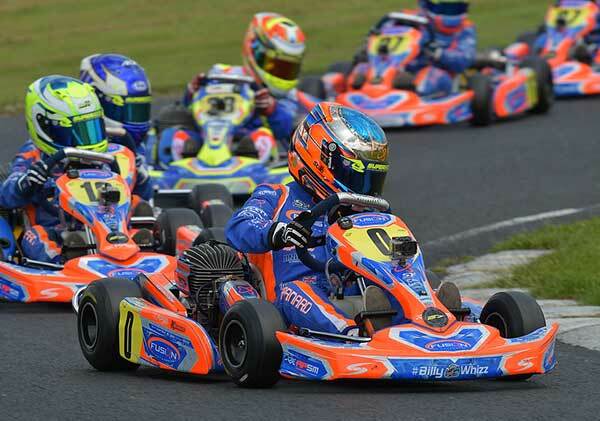 The Junior Maxes have two rounds left, the next one scheduled for Larkhall on 13th August.